You may not have heard of Trompe l’oeil before, but it’s likely that you’ve seen some artwork inspired by this French technique. 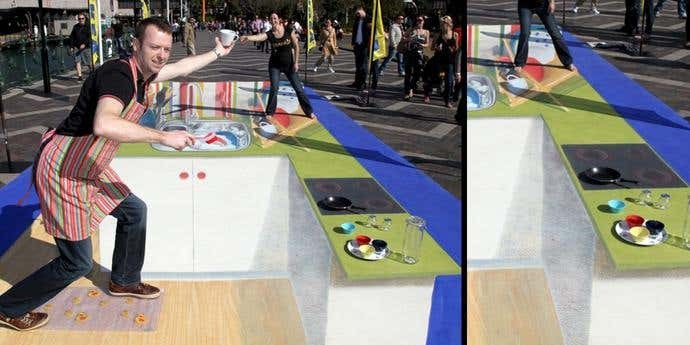 Trompe l’oeil, which means to ‘deceive the eye,' is a technique that uses realistic imagery to create the optical illusion that the depicted objects are three-dimensional. People coming out of the artwork as if they are escaping from within, swimming pools that appear to be as deep as the ocean, winding stairs that seem to go on forever and ever - these are all examples of Trompe l’oeil. Trompe l’oeil challenges your senses, forcing you to stop and stare as you are mesmerized by the magical illusion. Keep reading if you want to see 30 amazing Trompe l’oeil pièces created by some incredibly talented artists. But prepare yourself - these pieces of artwork will seriously challenge your mind! Edgar Mueller was born in the West of Germany in 1968. His fascination with art and painting began in his early years and went on to win numerous competitions as a teenager. Mueller has been known as the ‘master street painter’ for almost two decades and uses the Trompe l’oeil technique in his work. Mueller paints over large areas of public footpaths and walkways, forcing passers-by to stop in their tracks and observe the incredible illusion at their feet. Below you will see some examples of Mueller’s work. This Trompe l’oeil piece was inspired by the London earthquake that unearthed a mysterious cave. Initial investigations established that the cave is over 10 million years old. Using this astonishing discovery as inspiration, Mueller created the ‘Mysterious Caves in Europe’ piece that depicts the intriguing cave beneath the ground. This incredible piece of artwork challenges the beliefs of those who view, opening their minds to the possibilities of what may lie beneath. Mueller created this piece in August 2011 at the Aarhus Festuge Festival in Denmark, one of the largest cultural events in Scandinavia. Despite numerous challenges including inclement weather, Mueller was able to create this stunning and inspiring piece on time. 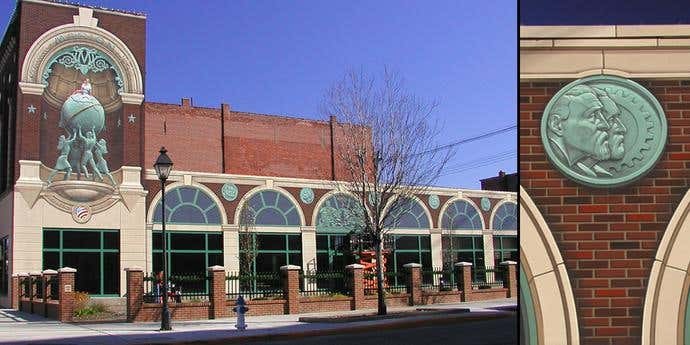 This Waterfall was created by Mueller in Moose Jaw, Canada, as part of the Prairie Arts Festival in 2007. It was one of the first of Muller’s largest street paintings covering an area of 280 square meters. With a little help from some local artists, Mueller was able to transform the street into a beautiful waterfall atop a raging river. Eric Grohe is an American Artist, born in New York City in 1944. He worked as a graphic designer and illustrator for much of his early life, and his projects continued to grow. Grohe soon began to design large-scale trompe l’oeil murals, which he still does today. He has received international recognition for his work and is responsible for some iconic pieces of work as seen below. The Great American Crossroad mural covers a gray wall and gravel parking lot that was once an eyesore for local residents. 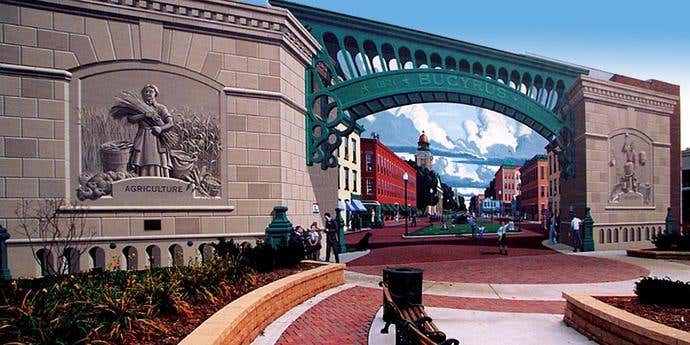 Eric Grohe came along and transformed the dark setting into a stunning piece of art, turning the town square into a beautiful Trompe l’oeil attraction. Over 80 local citizens appear in the mural, posing for Grohe as he brought the wall to life. 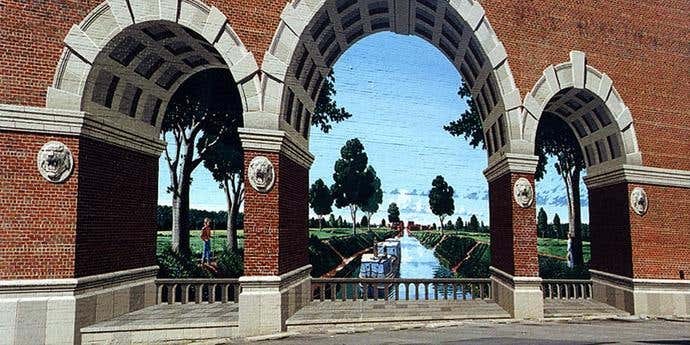 The Ohio & Erie Canal is represented in this painting exactly as it passed through the town of Massillon, Ohio. The piece cleverly uses the brickwork as part of the architectural setting, creating a vivid, lifelike representation of the famous river. This is yet another stunning piece created by Eric Grohe in the state of Ohio. The Heart of Ohio piece transformed a run-down building into a new landmark with his amazing 3D artwork. The piece depicts the foundations of the town, including pioneers, agriculture, industry, and education. The globe represents the future, and the young woman featured in the mural represents the present. The piece also features some iconic members of the town’s history, making this piece the pride and joy of the local citizens. 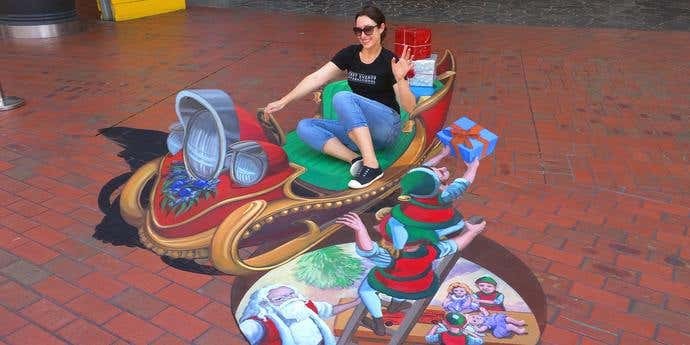 Jenny McCracken is known as Australia’s most highly awarded pavement artist. 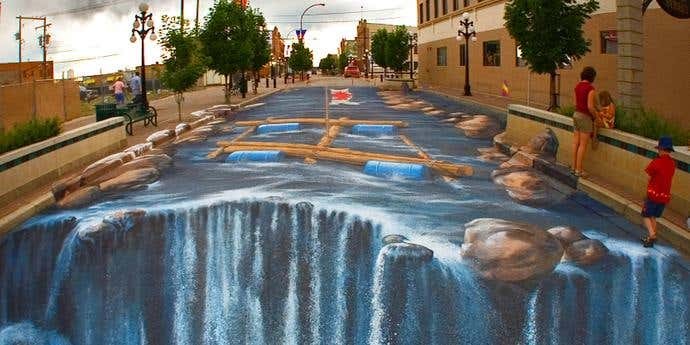 She creates incredible 3D pavement art and trompe l’oeil murals all around the world. She has worked with clients such as the Walt Disney, Paramount Pictures, Mazda, Ford, and Ikea! 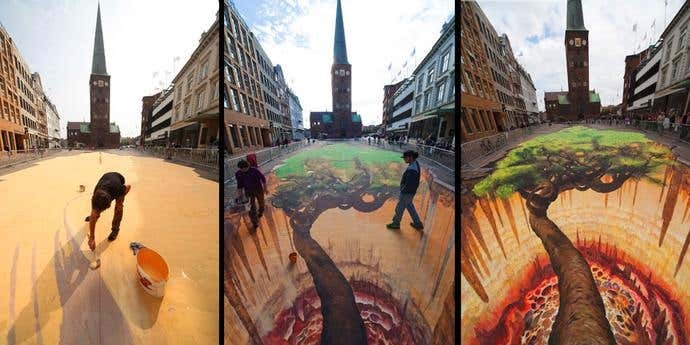 She has also won the 2015 World Street Painting Festival in the Netherlands! Here are some of our favorite pieces from Jenny’s collection. 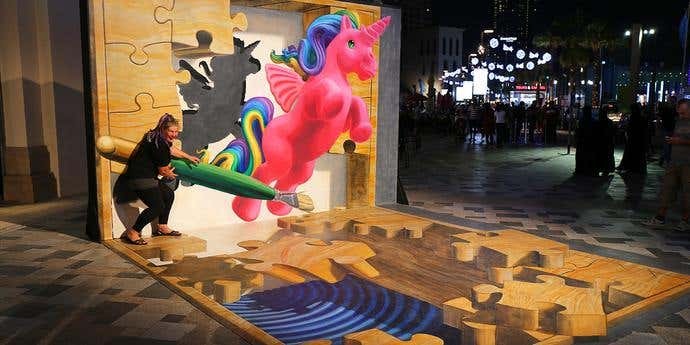 Jenny’s stunning piece, ‘Puzzling Realities,' appeared in Dubai as a 3D wall and floor artwork. The 3D piece features a partly solved jigsaw puzzle, with a magical pink unicorn pouncing out from within. This incredible piece was a popular attraction among the crowd as they stopped by to admire Jenny’s amazing work and take photos of the mystical unicorn. 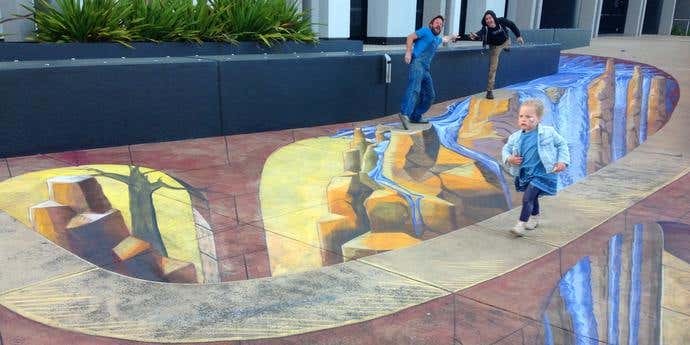 This incredible Trompe l’oeil street art piece is the largest 3D art in the Southern Hemisphere! Jenny teamed up with Leon Keer from the Netherlands to create this stunning 350 square meter masterpiece for the Chalk Urban Art Festival in 2014. The pair also enlisted the help of 6 Australian artists, with the project taking over six days to complete. The incredible piece gives the impression that the ground has been torn open, revealing a wonderful world underneath including a baby, a robot bird, and a Koala! There is an amazing time-lapse video on Youtube of the creation of ‘Wasting Time’ that is well worth checking out. This stunning mural is not only beautiful and captivating, but it also displays a powerful message. Appearing in Bondi, the piece of art was designed to send a message about littering in the ocean and encourage beachgoers to take extra care of the environment. 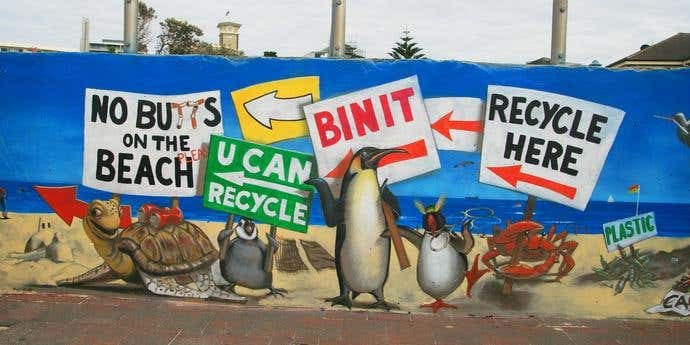 The mural depicts some animals in Trompe l’oeil style, including a friendly penguin and a smiling turtle, driving home the message to recycle and use rubbish bins. The piece is an excellent use of art to send a positive message. Jenny’s Toxic TV street art depicts a broken television oozing out black sludge and melting the couch that sat in front of it. 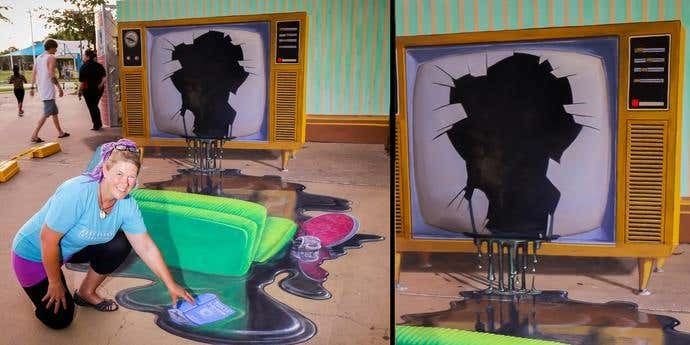 As a representation of what too much TV can do to a person, this fun piece uses bright colors and 3D features to create a stunning display of Trompe l’oeil. This fun piece was created for Ikea, showing off a Kitchen scene in 3D form. The street art displays a kitchen counter and floor, as well as a sink full of dirty dishes. The scene looks incredibly lifelike, and the Trompe l’oeil technique has been used cleverly. The piece attracted a huge crowd and was a great marketing move by Ikea. This captivating piece of street art sent children’s imaginations running wild as they admired Santa’s sleigh in incredible detail.The piece also depicts a hole in the ground, with Santa peering up to ensure his elves climb the ladder and deliver the presents on time. 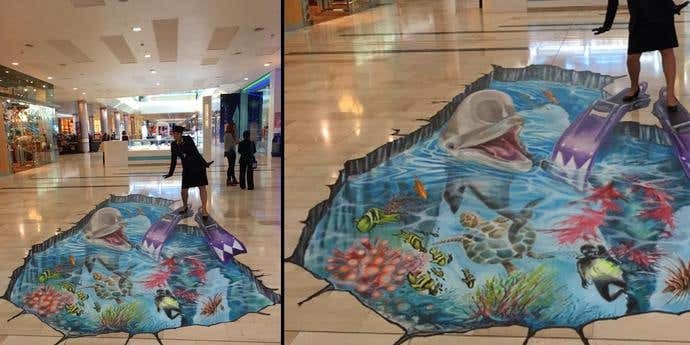 The Trompe l’oeil inspired artwork with a Christmas theme appeared at a Westfield shopping center in Victoria, Australia. The piece was a big hit with kids as they took photos with Santa and his magical sleigh. Jenny brought the Teenage Mutant Ninja Turtles to life in her Trompe l’oeil inspired piece in 2014. 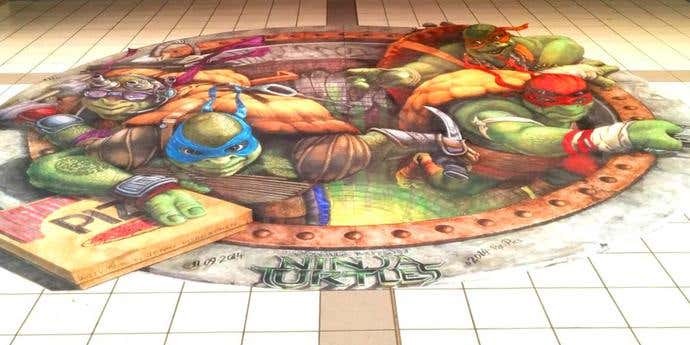 The 3D artwork was a part of the new TMNT movie launch and features all four Ninja Turtles. It gives onlookers the impression that they are emerging from the sewer, and they’ve even brought pizza with them! This piece was extremely popular with moviegoers, and it’s easy to see why! Anton Pulvirenti is a talented artist from Sydney who draws, paints, and creates 3D illusions and murals using the Trompe l’oeil technique. 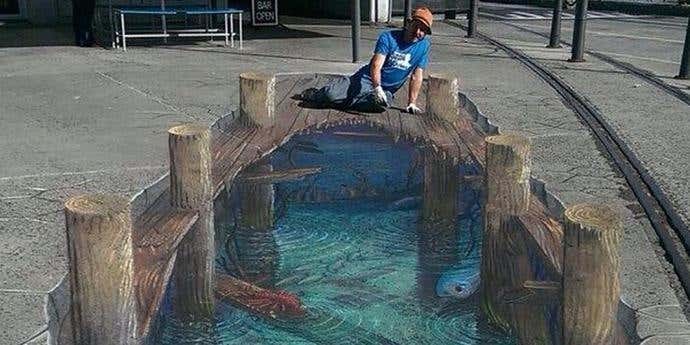 His talents won him the ‘Champion Pavement Artist’ award at the Chalk Urban Art Festival in 2007. He has worked all around the world, including being a featured artist at the Qatar Marine Festival in Doha. Anton has worked with Aussie Children’s TV Show ‘Play School’ and even Snoop Dogg! The contrast between Play School and Snoop Dogg goes to show how diverse his talents are. This piece really ‘threw a spanner in the works,' as Anton created the visual impression of a hand emerging from the sewer gripping a spanner tightly. The piece was designed to bring awareness to the new Central to Eveleigh train line, featuring a hashtag with the new line. This piece showcased the Trompe l’oeil technique very well and was a big success. Anton created this fantastic piece of artwork as a part of Fox Sports’ NRL Finals coverage in 2016. The 3D Trompe l’oeil inspired piece appeared at Central Station in Sydney. 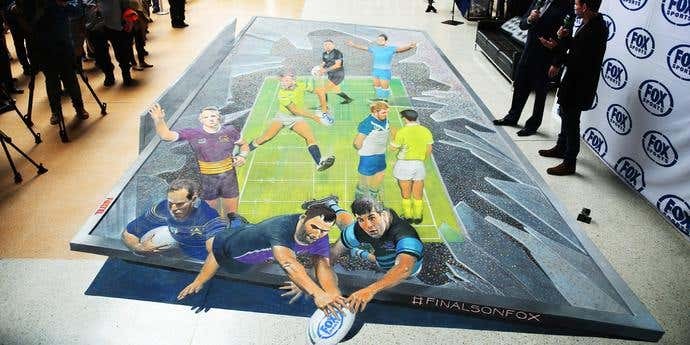 The image was 10 meters long and featured iconic moments from the NRL season, including Jarryd Hayne’s memorable celebration. The Horizon Festival is an Arts and Culture Festival held in the small town of Nambour in Queensland, Australia. The festival celebrates dancing, painting, photography, acting, and many others art forms, as well as fine food and beverages. 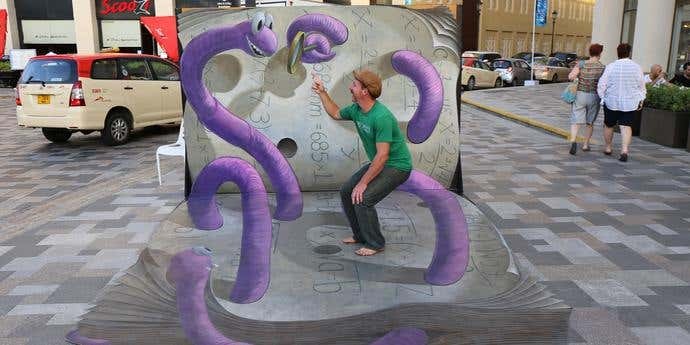 Anton created this unusual piece of 3D street art as a part of the festival celebrations. 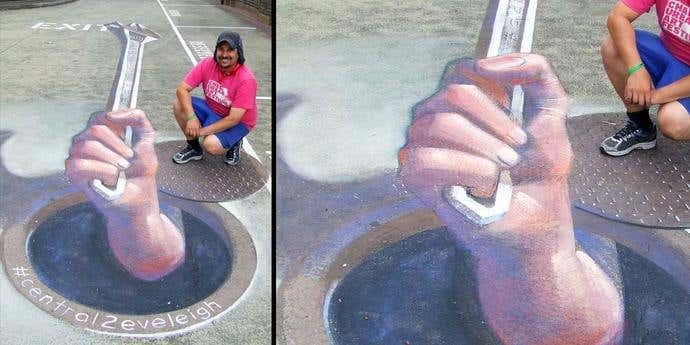 The piece depicts a skater emerging from the sewer with his trusty skateboard under his arm. Rudy Kistler is another talented Aussie artist who features the Trompe l’oeil technique in his 3D street art. He has created some iconic works of art around Australia, and has even traveled and worked internationally in destinations such as Kuwait and Dubai. Below are our five favorites pieces by Rudy, and they are some of the most impressive Trompe l’oeil works you will ever see! This piece for the NSW State Library was created by both Rudy Kistler and Anton Pulvirenti. Appearing on the floor of the library, it gives the impression that the stairs will take you down to another level beneath the floor. 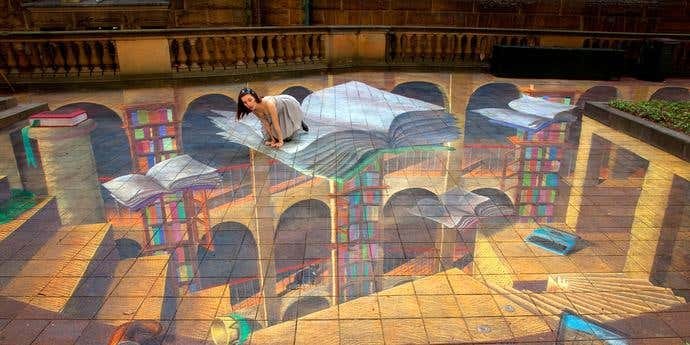 Floating books provide the safest place for cover, as the lady pictured peers down at the scene below. 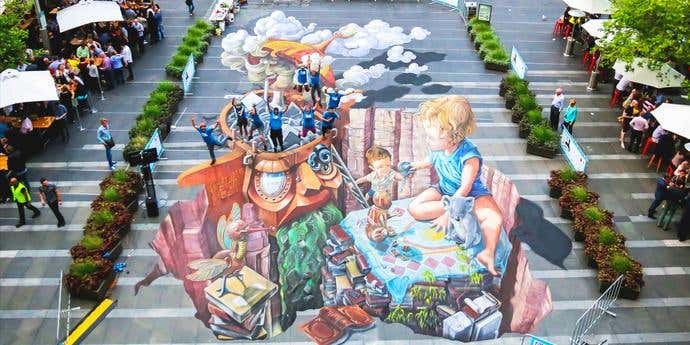 This amazing use of 3D art provided a great spectacle at the NSW State Library and resulted in an increase in traffic as many people came to admire the stunning artwork. The Dubbo Dream Festival is a festival of dance, visual arts, music, and outdoor events held in the New South Wales city of Dubbo. Rudy created this fantastic piece as a part of the festival celebrations. As you can see from the photo, the piece was incredibly popular with children and families, as they enjoyed the magical impression of the ground beneath looking like it has broken away. This piece was created by Rudy in the country of Kuwait. The artwork gives the impression that an earthquake has hit and forced the floor to crack wide open. 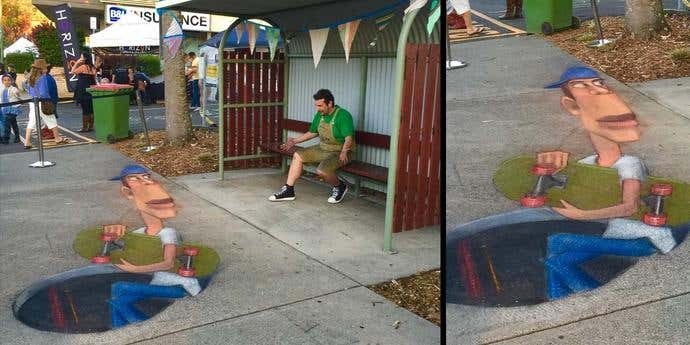 The realistic imagery looks so believable that children can often be mesmerized by the art. The smart use of shadowing even makes the birds appear as if they are hovering above the ground. This piece is a fantastic example of Trompe l’oeil. Rudy was featured in the Dubai Canvas 3D Art Festival, where he created this brilliant piece featuring a friendly bookworm. The 3D worm appears to be coming towards you, thrilling onlookers as they admired the incredible Trompe l’oeil piece. This wall and floor artwork appeared on a busy Dubai street, making it a great spectacle for passers by. This incredible piece of Trompe l’oeil inspired art was created in Hobart, to promote tourism and welcome visitors to the Australian state of Tasmania. The piece gives the impression that the ground is being torn up to reveal a broken pier underneath. The crystal blue water features some local fish, with a logo featuring a fork and a fishing rod, symbolizing the great wine and seafood that Tasmania has to offer. The Tamworth Country Music Festival is Australia’s largest music festival, featuring more than 2,800 events and 700 artists across 10 action-packed days. 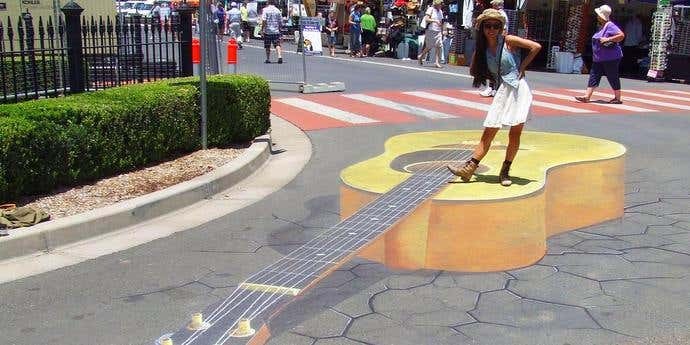 Rudy created an incredible piece of art for the Tamworth festival, featuring a classic guitar popping up from the road. The 3D artwork was a massive hit with visitors as people lined up to take photos with the Trompe l’oeil street piece. Street Advertising Services (SAS) is a team of highly talented street artists and creative technologists, who thrive on delivering mind-blowing experiences for brands and agencies. 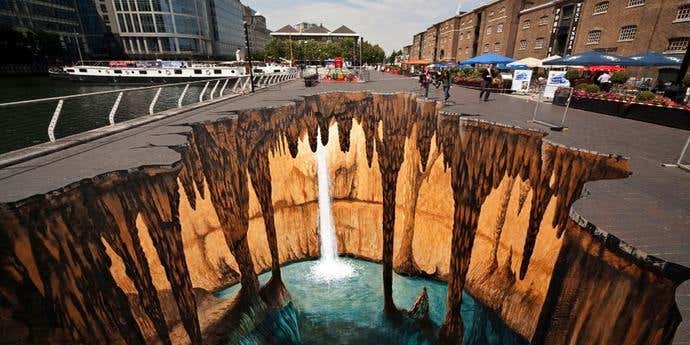 They often use the Trompe l’oeil technique in their impressive 3D street art and have even worked with brands such as Nike, Gillette, and M&C Saatchi. In the following photos, you will see just how incredible their artwork is! This 6m x 3m picture was created for the Eden Project in Cornwall. 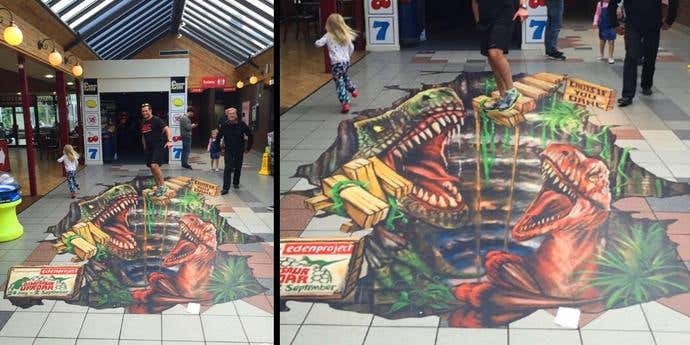 It was displayed in service stations throughout the South West of England with the aim to promote the new Dinosaur Uprising exhibition. The incredible Trompe l’oeil piece mesmerized passers-by as they stopped to admire the incredibly detailed 3D art. 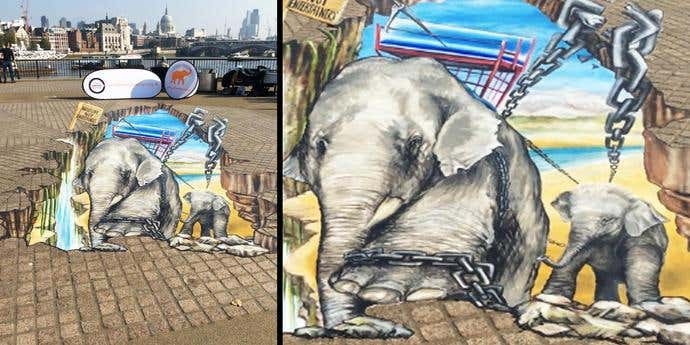 This 8m x 4m picture was created for the World Animal Protection charity to raise awareness of cruelty against elephants in the form of ‘training’ the elephants to carry tourists in Asia. The campaign was viewed and shared by over 3 million people and added thousands of signatures to their petition which resulted in some travel agencies deciding to stop offering elephant rides to their customers. This piece was created for Dorling Kindersley, the publisher of iconic Star Wars books. 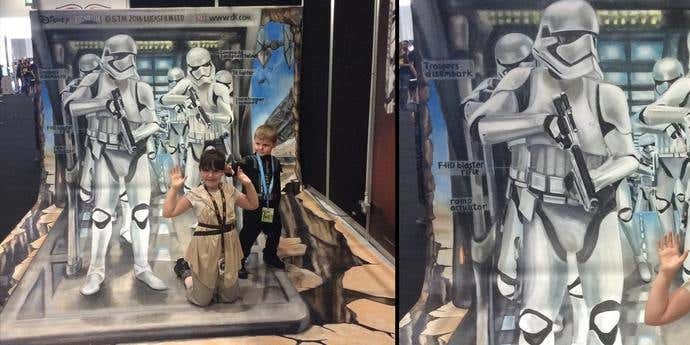 SAS were commissioned to create a 3D street art picture for Star Wars’ Celebration at ComicCon in London. The aim of the piece was to create attention for the new Rogue One and Force Awakens books. They certainly achieved their goal, producing an incredible Trompe l’oeil piece that brought the Star Troopers to life and wowed fans at the festival. The piece was photographed and shared by thousands of Comic book and Star Wars fans. 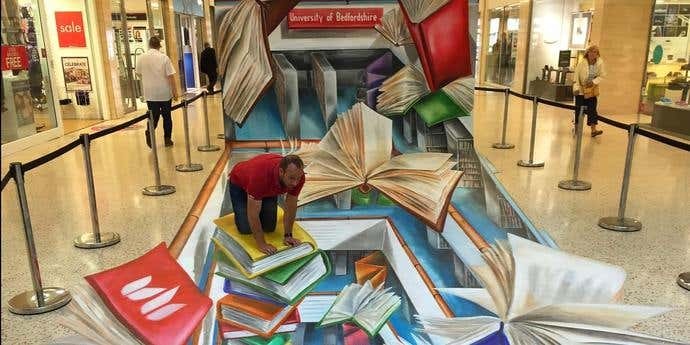 The University of Bedfordshire commissioned SAS to create a 3D art piece to celebrate the opening of their brand new ultra modern library. The Trompe l’oeil inspired work of art was designed to create a buzz around the new building, to attract future students to enroll at the University. This 8m x 4m x 3m wall and floor picture was featured at a mall in Luton and created a lot of excitement. Monarch Airlines commissioned SAS to create a fun and interactive picture to publicize the launch of Monarchs new air routes to Israel. The piece was wonderfully designed, depicting the floor being torn open to reveal an amazing underwater world. A friendly dolphin is pictured, along with coral, and giant flippers that onlookers can pose with. The Trompe l’oeil inspired piece created a lot of buzz for Monarch Airlines as visitors crowded around to admire the stunning piece of artwork. Gary Myatt is a highly talented London-based artist who creates fine art murals and Trompe l’oeil pièces. Gary has built an impressive portfolio over his 20 years of professional experience and has created some stunning Trompe l’oeil inspired art. Here are three of our favorites. 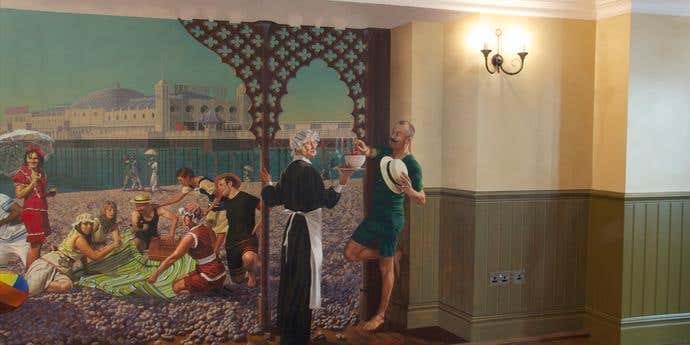 This mural, depicting the Brighton Pier, was commissioned for the Hotel du Vin, Brighton, in 2009. The image was painted in one of the hotel’s function rooms, and Gary wanted to open up space and give the illusion of looking out onto the beach. Once installed, he was able to tie in the surrounding architecture and floorboards, painting them into the image and blurring the boundaries between where reality and painted image meet. This Roman-themed image was commissioned the Hotel du Vin in York. 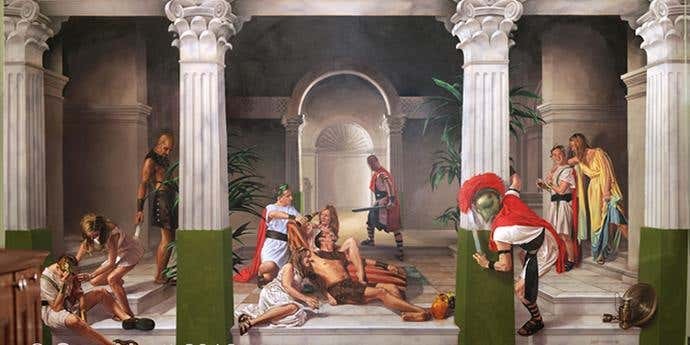 Gary used highly detailed trompe l’oeil architecture, along with marbling techniques in the foreground, which helped push the rest of the image back into an illusionistic space. The finished product gives the impression that you are looking from one room into another dimension. 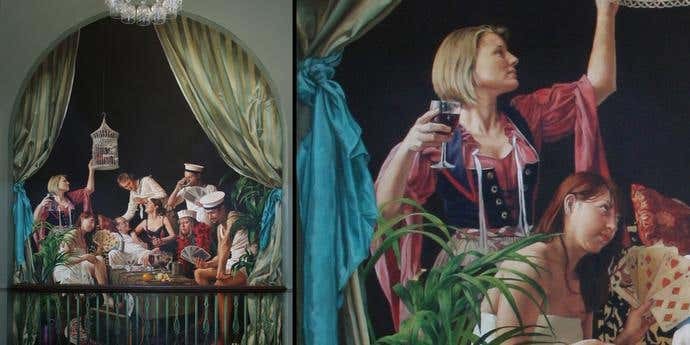 Drunken Sailors was another commission from the Hotel du Vin Group, for their Hotel in Poole, Dorset. The scene depicts drunken sailors playing strip poker with ladies of the night. As in the Brighton image, Gary wanted to blow the boundaries between the painted image and the actual architecture. The archway, drapes, and balustrades are all hand painted, though the handrail is not. 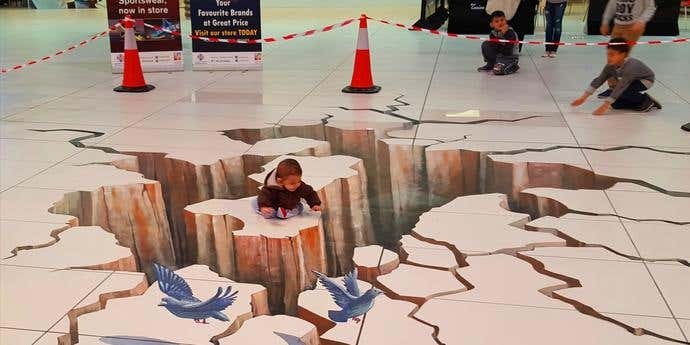 These trompe l’oeil artworks challenge your senses and showcase stunning and majestic optical illusions - a great way to grab the attention of an audience! Are you looking for an artist? Hiring an artist can be a great way to create stunning designs for your marketing, business or personal needs! You artworks can showcase your best designs and colour combinations, whether it be in the form of graffiti or drawings. Simply post a project on Freelancer and you'll receive bids from our talented experts in just seconds!